BRDC Superstars and Rising Stars were out gaining podiums again this weekend.Fellow BRDC Rising Star Henry Surtees had a promising weekend as he got to grips with the car and took a seventh place finish in the first race, while BRDC Superstar Jason Moore was 16th. BRDC Rising Star Robert Wickens made an amazing start to his Formula 2 career with a double victory at the opening two rounds in Valencia. The Canadian dominated the race, having started from pole position, in the first Formula 2 race to be run in 25 years. 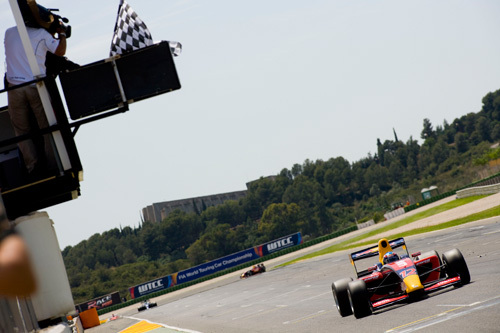 Race two saw Robert dominate once again, leading from lights to flag as he won five seconds ahead of the second placed driver Mirko Bortolotti. Henry finished this race in 12th, just two places ahead of Jason. Rising Star Brendon Hartley had two fourth place finishes at the second weekend of the Formula 3 Euro Series at the Eurospoeedway Lausitz. BRDC Superstar and Full Member Alexander Sims did not finish the first race but managed to finish the second in 22nd place. BRDC Superstar Jonny Adam took advantage of BRDC Full Member Mat Jackson’s late puncture in race one at Oulton Park in the British Touring Car Championship, which saw the Motorbase BMW driver grab the final podium spot. In race two Jonny was fifth and then 13th in the final race of the day. The other Superstar on track was Andrew Jordan who also claimed an amazing podium place in the final race of the day when he claimed a second. His first two races were also top ten finished as he was tenth in race one and then sixth in race two. The BRDC Rising Star took victory in the first race of the day, just staying ahead of fellow Rising Star James Sutton. And the pair repeated the story in the second race with Tim coming home over five seconds ahead of James. In the Formula Renault UK Championship, also part of the BTCC support package at Oulton Park, there was double victory for Dean Smith. The BRDC Rising Star produced a dominant display in scorching conditions to move in to third position in the championship, taking a lap record on the way. In race one fellow BRDC Rising Star Ollie Hancock was 17th, while the two BRDC Superstars Dean Stoneman and James Calado were 18th and non finishing. In race two, with Dean Smith first to the chequered flag once again, Dean Stoneman pulled an amazing race out of the bag to claim third place, just ahead of James Calado. Ollie Hancock did not finish this one. Rounds five and six of the British GT Championship were at Rockingham over the weekend and the best result from BRDC Members came courtesy of Rising Star Aaron Scott who was fourth in the second race on Sunday with co-driver Craig Wilkins. The other junior BRDC Member on track was Rising Star Nigel Moore who was 11th. Earlier in the day Nigel was eighth but Aaron failed to finish the first race. BRDC Rising Star Henry Arundel drove superbly in the second of two Formula 3 races at Rockingham to secure second place, his first podium in F3. Henry finished the first race of the weekend, on Sunday morning, in seventh. BRDC Rising Star Max Chilton was fifth in race one, just one place ahead of Superstar Riki Christodoulou. In the second race Max was tenth, while Riki did not make the finish. Superstar Wayne Boyd had two more steady performances after moving up to the class this season finishing in ninth place in race one, just ahead of Rising Star Jay Bridger. In race two Wayne was 11th, while Jay managed an eighth place. Early season pace setter Daniel Ricciardo failed to finish the first race, but was fifth in the second while another Rising Star, Hywel Lloyd, also didn’t make the chequered flag in the first race but was ninth in the second. Kieron Vernon was the sole BRDC representative in the Formula Ford championship at Rockingham and showed steady progress throughout the weekend. The BRDC Rising Star finished the first two races in 12th place, while his final race of the weekend saw him finish 16th.